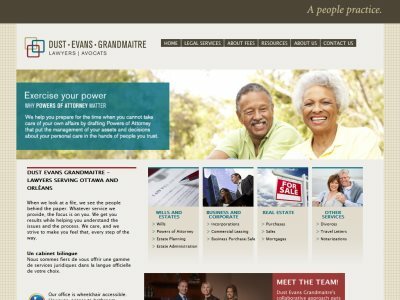 Dust Evans Grandmaitre Professional Corporation is a law firm in Ottawa (Orléans), Ontario. Founded in 1979. Practice Areas: Wills And Estates (Wills, Powers Of Attorney, Estate Planning, Estate Administration), Business And Corporate (Incorporations, Commercial Leasing, Business Purchase/sale), Real Estate (Purchases, Sales, Mortgages), Other Services (Divorces, Travel Letters, Notarizations).